This picture shows freshly harvested spring salad from the garden at the Trust. It contains several varieties of lettuce, red veined sorrel, baby chard leaves and endive, which can just be seen peeping out from under all the flowers! 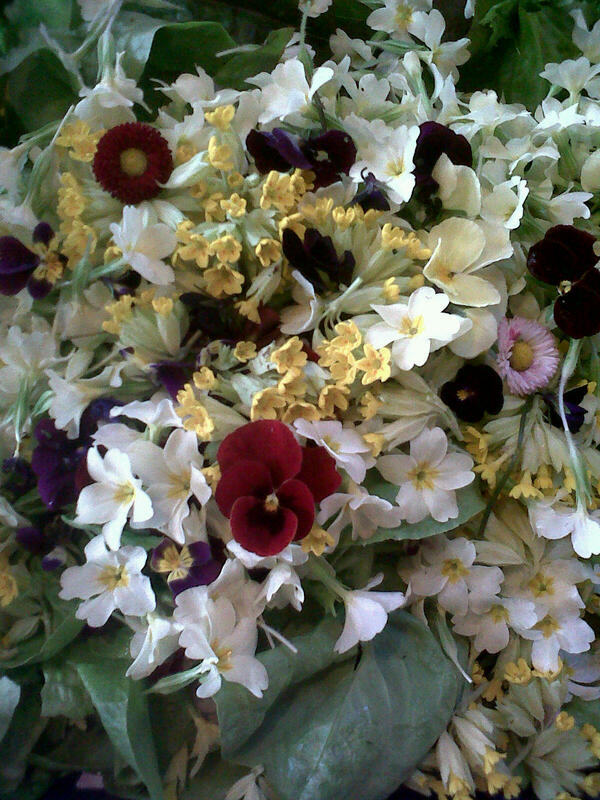 The flowers are Primrose, Cowslips, Heartsease, various coloured Pansy and Bellis Perrenis, making up a colourful, fragrant and tasty salad. We really enjoy putting lots of flowers into our salads. They taste good, look nice and the children love eating them. The combination of leaves and flowers changes with the seasons – other flowers we use include various Campanulas, Calendula, Chervil, Malope, Musk Mallow and Nasturtium. Some of the salad plants are grown as perennials (sorrel and most of the flowers in this particular salad). We are trying to increase the amount of perennial vegetables that we grow, as we have found perennials to be much more reliable with the uncertain and extreme weather patterns that we have been experiencing. We also have had success with self-seeding annuals, especially Corn Salad and Winter Purslane. We sell a small amount of our surplus vegetables, including flower-packed salad at the Country Market in Newcastle Emlyn. The market is held every Friday, 9.30am until 12.30pm in the Catholic Hall. For more details about the market, see their Facebook page. This entry was posted in Permaculture and tagged flowers, local market, newcastle emlyn, perennial, Salad. Bookmark the permalink.